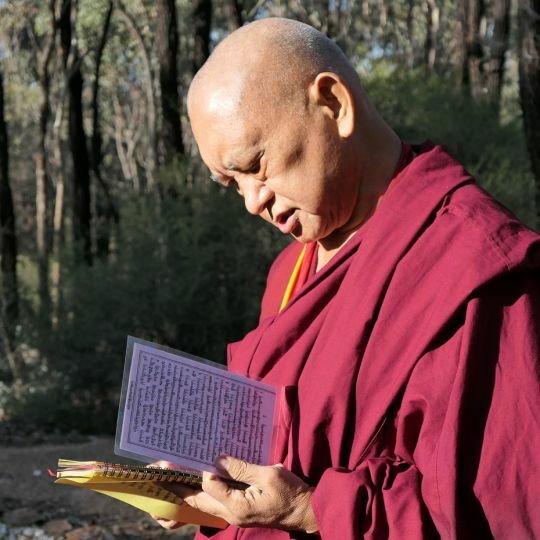 Lama Zopa Rinpoche doing water offering, preta offering, and offering to Dzambala near the Great Stupa of Universal Compassion, Bendigo, Australia, April 2018. Photo by Ven. Roger Kunsang. Whatever you do to please the guru, just there [by doing that], without even doing many hundreds of thousands of prostration, your karma changes. If you’re going to be reborn in the lower realms, in the hell realms, just in that minute [that you please the guru], [your karma] changes to being born in a pure land, perfect human rebirth. You have to know this, and practice mindfulness. Because of the guru’s kindness, it is like this. Whether you are with the guru or whether you are far away, it doesn’t matter. Just within that minute everything changes without needing to go through all these preliminary practices. You understand? You have to pick up the point. Like my teacher Geshe Rabten, you have to keep your mind always on the one thing that brings you to enlightenment quickest, that frees you from samsara quickest. Your whole life you meditate, meditate, but it is not sure [the result]. You have to understand the most important point—the profit in your life, not talking business profit but Dharma profit, the biggest profit, Dharma practice—the quickest way to achieve enlightenment and become free from samsara. You have to know this and practice this example, whether you are close to your guru or whether you are far. By pleasing the guru all the buddhas become pleased. By fulfilling the guru’s holy wishes and advice, every day, every hour, minute, second, living in the vow, monk or nun or lay vow, whatever, I’m just giving different examples. In this way you fulfill the guru’s holy wishes and advice. Then also pleasing the guru by doing retreat, that retreat the guru advised, then with each mantra you recite, you get closer, very quickly, you become closer to liberation. You become free from samsara. Each time as you recite what the guru advised you, you get closer to enlightenment, each time you recite the mantra.